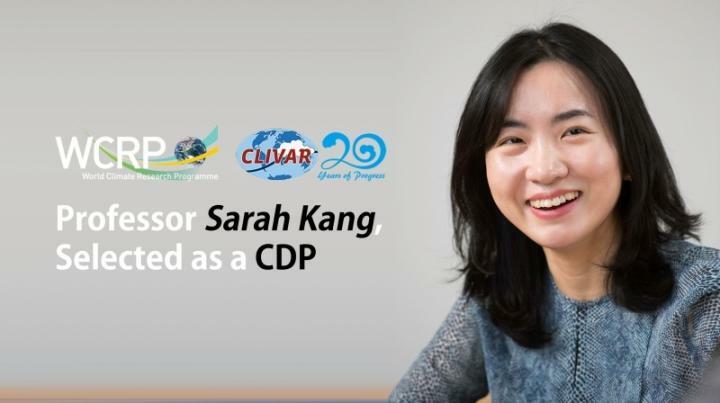 Sarah Kang, Professor in the School of Urban and Environmental Engineering at UNIST has been appointed to the new Climate Dynamics Panel (CDP) of the Climate and Ocean: Variability, Predictability and Change (CLIVAR). Among the 12 professionals named to the 2018 cohort, Professor Kang is the only scientist, affiliated with a South Korean research institute. CDP is an international panel on climate dynamics, one of the nine groups, convened under the Climate and Ocean: Variability, Predictability and Change (CLIVAR). The panel is charged to review and identify key research priorities and scientific advances related to climate dynamics, thereby providing recommendations that could further improve our present understanding of atmosphere-ocean climate dynamics. They also offer various programs for the development of scientific and technical capabilities in this field. Professor Kang will be appointed for a three-year term of office, beginning January 2018. CLIVAR is one of the four core projects of the World Climate Research Programme (WCRP) that addresses climate variability and predictability, with a particular focus on the role of ocean-atmosphere interactions in climate. Its mission is "To improve understanding and prediction of the ocean-atmosphere system and its influence on climate variability and change to the benefit of society and the environment." "I am deeply honored and grateful to have been chosen as the new member of the Climate Dynamics Panel," says Professor Kang. "Receiving this recognition is a great honor, as this is a very rare case for a Korean to be named as CDP members." Professor Sarah Kang received the B.S. degree in Atmospheric Sciences from Seoul National University, Korea and the Ph.D. degree in Atmospheric and Oceanic Sciences from Princeton University, United States. She joined the School of Urban and Environmental Engineering at UNIST in 2011. Prior to joining UNIST, Professor Kang worked as a postdoctoral fellow at Columbia University, United States. The WCRP was established in 1980, under the joint sponsorship of the World Meteorological Organization (WMO) and the International Council for Science (ICSU), and has been also sponsored by the Intergovernmental Oceanographic Commission (IOC) of UNESCO.